For the control and treatment of internal parasites of sheep including those with single or dual resistance to macrocyclic lactones (including moxidectin resistant strains), benzimidazoles or imidazothiazoles (levamisole / morantel). Note: Where Barber's Pole worm (Haemonchus contortus) is known to be resistant to macrocyclic lactones and benzimidazoles and imidazothiazoles (levamisole / morantel), Triguard may have limited efficacy. Also provides a selenium and cobalt supplement for sheep raised in selenium and/or cobalt deficient areas. 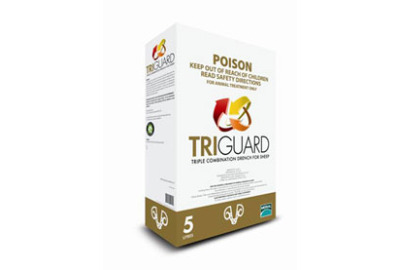 With high potency triple-combination protection, Triguard can deliver highly effective worm control even where high levels of resistance are present and over a broad spectrum of worms. Triguard is active against sheep roundworms that have single or dual resistance to the ML (including moxidectin), benzimidazole or imidazothiazole (levamisole) families of chemicals. MILK: DO NOT USE in ewes, which are producing or may in the future produce milk or milk products for human consumption. ESI (Export Slaughter Interval): DO NOT use less than 28 days before slaughter for export. 1 mL / 5 kg body weight, which provides 0.2 mg abamectin, 4.5 mg oxfendazole, 6.8 mg levamisole (8 mg levamisole hydrochloride), 0.1 mg selenium and 0.44 mg cobalt per kg body weight.